Mary Steichen was born circa 1857 at Germany; Death Record for Joseph, listed information on his parents. She married Nicholas Yungers, son of Frederick Yungers and Anna Conrad. Her married name was Yungers. Walter R. Johnson was born circa 1888 at Minnesota; Birth Record for Evelyn, listed information on her parents. He married Mary Elizabeth Jansen. Walter R. Johnson was a Farmer. Mary Elizabeth Jansen married Walter R. Johnson. Mary Elizabeth Jansen was born circa 1893 at Minnesota; Birth Record for Evelyn, listed information on her parents. Elmer Fredolph Steele was born circa 1906 at Minnesota; Birth Record for Willard, listed information on his parents. He married Elvira Lohman. Elmer Fredolph Steele was a Farmer. Elvira Lohman was born circa 1910 at Minnesota; Birth Record for Willard, listed information on his parents. She married Elmer Fredolph Steele. Her married name was Steele. Alec McGuinn married Mary McDonough. Mary McDonough married Alec McGuinn. Her married name was McGuinn. [S1546] Clifford Boyce, compiler, "Ancestral File Number Z2Z1-NP"; for Joseph Boston Jr., Ancestral File, 4.19 (1993), Family History Library:, 35 North West Temple St., Salt Lake City, Salt Lake Co., Utah. Hereinafter cited as "AFN Z2Z1-NP." Child of Amelia Sprague and Joseph Boston Jr.
[S1547] Clifford Boyce, compiler, "Ancestral File Number AFN Z2Z1-PV"; for Amelia Sprague, Ancestral File, 4.19 (1993), Family History Library:, 35 North West Temple St., Salt Lake City, Salt Lake Co., Utah. Hereinafter cited as "AFN Z2Z1-PV." Her married name was Perkins. Lucy Katherine Featherstone was a housewife. Her Social Security Number was 474-54-8252 in 1963 at Minnesota. Residence had been in Red Wing, Minnesota.3 She lived in July 1968 at 1005 Fourth St., Red Wing, Goodhue Co., Minnesota.2 The cause of death was congestive circulatory failure for 3-days, due to decompensated hypertensive heart disease for 30-days and arteriosclerosis for 1-year on 3 August 1968.2 History of Goodhue County Minnesota, 1935, page 330. [S1467] Unknown compiler, CENSUS: 1920 MN, Goodhue Co , Featherstone twsp , E D 43, sheet 6 (n.p. : n.pub.). [S1575] Lucy Katherine Featherstone, unknown file number, SSDI - Lucy Perkins, unknown series (n.p. : n.pub.). Hereinafter cited as SSDI - Lucy Perkins. [S1468] Lucy Katherine Featherstone cemetery marker; unknown reader. Vernon Leroy Perkins was born on 20 September 1909 at Featherstone, Goodhue Co., Minnesota.2 He was the son of Timothy LeRoy Perkins and Lucy Katherine Featherstone. Vernon Leroy Perkins married Vivian Dorothy Bang, daughter of Charles F. Bang and Clara Kolshorn, on 8 August 1935.3 Vernon Leroy Perkins died on 31 March 1987 at age 77.4 He was buried at Hope Cemetery, Featherstone Twsp., Goodhue Co., Minnesota. He lived at Red Wing, Goodhue Co., Minnesota.5 His Social Security Number was 469-42-2183 issued in Minnesota before 1951.5 History of Goodhue County Minnesota, 1935, page 330. Vernon and Rosa were apparently twins. [S1469] Vernon Leroy Perkins entry, birth, Goodhue County Courthouse, Red Wing, Goodhue Co., Minnesota. [S1470] Vernon Leroy Perkins cemetery marker; unknown reader. [S1561] Vernon Leroy Perkins, unknown file number, Social Security Death Index - Vernon Perkins, unknown series (n.p. : n.pub.). Hereinafter cited as Social Security Death Index - Vernon Perkins. [S1471] Mary Featherstone Perkins entry, birth, Goodhue County Courthouse, Red Wing, Goodhue Co., Minnesota. [S1752] Red Wing Republican Eagle Newspaper, online www.republican-eagle.com, Obituary of Mary Gehrman, published 06 April 2006. [S1752] Red Wing Republican Eagle Newspaper, online www.republican-eagle.com, Published Thursday, April 06, 2006. [S1752] Red Wing Republican Eagle Newspaper, online www.republican-eagle.com, Obituary of Mary Gehrman, published Thursday, April 06, 2006. 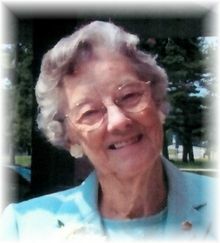 CUYAHOGA FALLS - Grace Perkins Page was born October 11, 1914 in Red Wing Minnesota and died May 1, 2011. She began this 96 year life on a farm surrounded by the large families of her father Timothy Perkins and her mother Lucy Featherstone. Enabled by a princely scholarship of $25, she was able to attend Hamline University in St. Paul where she met Clarence Page. They married in 1938 and moved with Firestone to several states before ending in Ohio in 1952. She made many loving, life-long friends as a Girl Scout leader, an active quilter at the First United Methodist Church, and a member of PEO. She created her own designs for hundreds of unique and beautiful "Page Bags" whose owners will now treasure them. She was intuitive, nurturing, endlessly kind and a steadfast friend. She was self-effacing, frugal and attentive to details. She was a wonderful correspondent and treasured receiving letters from others. She will be lovingly remembered by her daughters and their husbands Peggy and Bob Springer and Patsy and Bob Moyer and their children Kari and Matt Beery, Todd and Gina Springer, Vanessa Moyer and Mark Mills, and Cassandra Reeder, and her great-grandchildren Quinn and Grace Springer, Carson and Spencer Reeder and Emerson and Olivia Beery. Her memorial service will be at 12:00 noon on Friday, May 6 at the First United Methodist Church, 245 Portage Trail, Cuyahoga Falls, OH 44221. [S1472] Grace Boston Perkins entry, birth, Goodhue County Courthouse, Red Wing, Goodhue Co., Minnesota. She graduated in 1927 at Red Wing Central High School, Red Wing, Goodhue Co., Minnesota.1 She graduated in 1931 at University of Minnesota School of Nursing, Minnesota; nursing.1 Her married name was Perkins. History of Goodhue County Minnesota, 1935, page 330. RED WING -- A memorial service for Vivian D. Perkins will be at 11 a.m. Saturday at St. Paul's Lutheran Church in Red Wing, with the Rev. Kristen Schlauderaff officiating. Burial will be at a later date in Hope Cemetery in Featherstone Township, Goodhue County. Mrs. Perkins, 98, of Red Wing, died Monday (March 24, 2008) at the Fairview Seminary Home. Vivian Dorothy Bang was born Nov. 2. 1909, in Featherstone Township. She attended school in Hay Creek and graduated from Red Wing Central High School in 1927. She graduated from the University of Minnesota School of Nursing in 1931, and worked at Charles Miller Hospital in St. Paul until 1935. On Aug. 8, 1935, she married Vernon L. Perkins, and they were the third generation to farm the Perkins farm and apple orchard. They moved to Red Wing in 1986. She was a 4-H adult leader, belonged to the Home Extension Group, and was a member of Chapter P of the PEO and St. Paul's Lutheran Church. Survivors include a son, Larry (Carol) of Red Wing; two daughters, Rhoda (Marlyn) Rusch of Hollister, Mo., and Carol (Vernell) Draheim of Bricelyn, Minn; 15 grandchildren; numerous great-grandchildren; and a sister, Ruth Bang of Red Wing. She was preceded in death by her husband on March 31, 1987, a sister, two infant brothers, and a great-grandson. Her married name was Grimm. Selma Carlson lived in September 1969 at Red Wing, Goodhue Co., Minnesota. Obituary of brother George in 1969, listed surviving siblings. Her married name was Higbee. Esther Carlson lived in September 1969 at Red Wing, Goodhue Co., Minnesota. Obituary of brother George in 1969, listed surviving siblings. Betty Seiz married Donald V. Ramboldt Sr. Betty Seiz married Donald Ramboldt. Betty Seiz was born on 7 November 1929. She was the daughter of Benjamin Franklin Seiz and Anna E. Galvin. Betty Seiz died on 25 May 1994 at age 64. She was buried at Calvary Cemetery, Red Wing, Goodhue Co., Minnesota; Find A Grave Memorial 94460878. Her married name was Ramboldt. Obituary of father, listed Betty as his daughter. Donald Ramboldt married Betty Seiz, daughter of Benjamin Franklin Seiz and Anna E. Galvin. Mildred Perkins was born circa 1902 at North Dakota. She was the daughter of Dr. George A. Perkins and Minnie F. (?) Mildred Perkins married Guy E. McCune. Her married name was McCune. Mildred Perkins lived in 1941 at Fairmont, Martin Co., Minnesota. Obituary of father in 1941, listed daughter living in Fairmont. Guy E. McCune was born in 1895 at Minnesota. He married Mildred Perkins, daughter of Dr. George A. Perkins and Minnie F. (?). Robert McCune was born in 1932 at Minnesota. He was the son of Guy E. McCune and Mildred Perkins. Robert McCune lived in 1941 at Fairmont, Martin Co., Minnesota. Obituary of George Perkins, listed grandson Robert in Fairmont. Murray Samuel Vandeusen married Lena Miller. Murray Samuel Vandeusen was born on 13 October 1852. He died on 11 July 1908 at age 55. He was buried at St. Johns Cemetery, Red Wing, Goodhue Co., Minnesota. Death Record for son Louis, gave information on parents. Lena Miller married Murray Samuel Vandeusen. Lena Miller was born on 18 June 1863. She died on 4 April 1924 at age 60. She was buried at St. Johns Cemetery, Red Wing, Goodhue Co., Minnesota. Her married name was VanDeusen. Death Record for son Louis, gave information on parents. Freeman Emmant Perkins was born on 19 July 1906 at Houston, Harris Co., Texas.2 He was the son of Dr. Burton T. Perkins and Jennie Scott. Freeman Emmant Perkins was born circa 1907 at Texas.1 He died on 7 January 1988 at Houston, Harris Co., Texas, at age 81. He was buried at Forest Park Cemetery, Houston, Harris Co., Texas; Plot: Section 20 Restland. Died, in Union Tuesday March 14, 1922, W. Scott Harn, age 70 years, 11 months and 23 days. W. Scott Harn was born in Pennsylvania March 22, 1851, where he spent his boyhood days until January 18,1876, when he was married to Miss Louisa Stone, moving to Nebraska in 1878, where they lived for 24 years. In 1902 they moved to Oregon an have resided in Union ever since. To this union 11 children were born, two boys and two girls having passed on. He is survived by his widow and seven children. Albert of Murdo, South Dakota; Mrs. P. C. Lindsay of Arlington, Nebraska; Frank of Rupert, Idaho; Mrs. Anna Conally, of Mineral, Washington; Steve, Arthur and Russell, of Union; twenty three grandchildren, four great grandchildren, and many other relations and friends. Mr Harn was a highly respected citizen, quiet and unassuming, a kind and loving husband and father. He suffered greatly in his last illness, but was always patient and everything that a devoted wife and children could do was done for him until the Grim Reaper claimed him. Many friends extend sincere sympathy to the bereaved family. [S2339] Winfield Scott Harn, WWW.findagrave.com, http://www.findagrave.com/cgi-bin/fg.cgi?page=gr&GRid=34652912, n/a, n/a. Hereinafter cited as WWW.findagrave.com. Fannie Louisia Stein was born on 29 October 1858 at Canton, Fulton Co., Illinois.1 She was the daughter of male Stein and Anna Catherine "Kate" Vogt. Fannie Louisia Stein married Winfield Scott Harn, son of John Hanson Thornton Harn and Frances Leighty, on 18 January 1876.1 Fannie Louisia Stein died on 5 December 1941 at Ft. Steilacoom, Pierce Co., Washington, at age 83.1 She was buried at Union Cemetery, Union, Union Co., Oregon. Mrs. Fannie Louise Harn, 84, of Seattle, died Friday in a local hospital. She was a member of the Pentecostal church and leaves five sons, Albert of Plentywood, Mont; Steve and Arthur of Union, Ore; Frank of Venice, Calif., and Samuel of Elbe; two daughters, Mrs. Ida Lindsay of Hardington, Neb., and Mrs. Mary Connally of Seattle; 20 grandchildren, 25 great grandchildren and five half brothers, Steve and Charles Leis of Oregon City, George Leis of Seattle, Cal Leis of Nebraska and Henry Leis of San Francisco. Funeral services will be held Monday morning at 10:30 o’clock at Buckley-King’s , with the Rev. T.J. Creighton of Elbe officiating. Burial will be at Union Junction, Ore.
Children of Anna M. Harn and Thomas L. Connally Sr.